The most important consideration in trading is the direction of the overall trend. This is especially true in Foreign Exchange as trends tend to stay in place longer than in any other market. The reason is that FX reflects actual money moving from one economy to another. Whether the flow of money from one economy to the other is caused by trade between the two economies or investments (capital flows), once those natural forces are in place, they can stay in place for extended periods of time. It is sort of like a fully loaded supertanker in the open ocean at full speed, even if you cut the power, it will continue to drift in that same direction for an extended period of time. How do we determine the overall trend? The first step is to just look at the chart. The strongest trends should be visible from across the room. 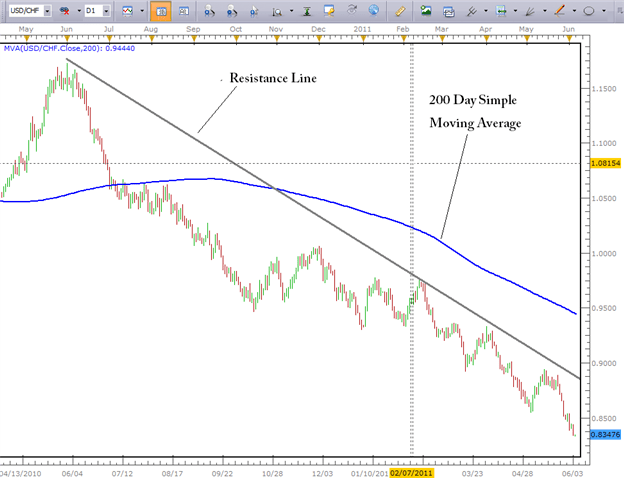 A currency pair’s position in relation to the 200 Day Simple Moving Average is also a popular method. Support and Resistance lines can help the trader look for entries in the direction of the overall trend. On the Chart above, we can see that the USD/CHF is in a clear downtrend. The trend is visible from across the room. Prices are well beneath the 200 Day Simple Moving Average. If we connect the highs, we can see short term and long term resistance lines that can help us when looking for specific entries. However, there are other tools that can give us insight into the relative strength of the overall trend. The ADX or Average Directional Index is another tool a trader can add to their arsenal. The ADX is unique in that it measures the strength of the trend alone. In other words, if one pair is in a strong uptrend and another pair is in a strong downtrend they will both have high ADX readings. Once the ADX is applied, it gives us the ability to see a little deeper into the true nature of the trend. 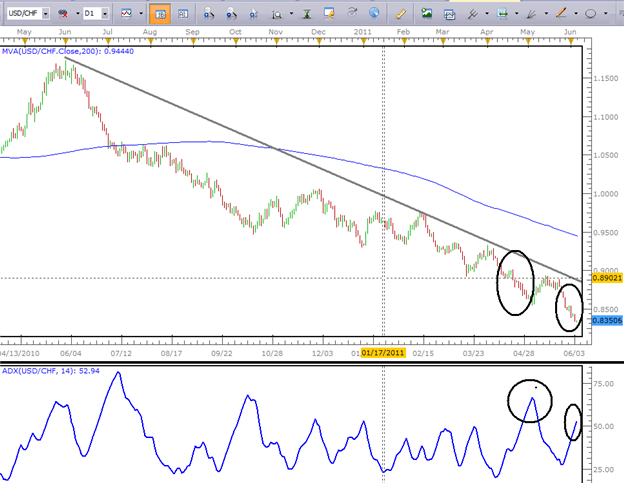 For example, on the USD/CHF chart above, we can see that during the last short term down move, ADX was well above 60. However, during the recent decline, ADX only managed to move to the 50 area. While these both are still considered very strong trends, we can see that the first circle down move was stronger than the second circle down move. This means that while the trend is strong, it could be weakening in relative terms. Matt Russell regularly contributes to the Instructor Trading Tips and records a nightly trading Video with specific trade set ups called London Calling. To receive more timely notifications on his reports and videos, emailmrussell@fxcm.comto be added to his distribution list.